The first trailer for M. Night Shyamalan's Unbreakable/Split crossover, titled Glass, has hit the web and man is it a doozy. As a huge fan of Unbreakable and someone who more admired what the writer/director was doing in Split if not necessarily feeling like he fully capitalized on the premise or James McAvoy's terrific lead performance. 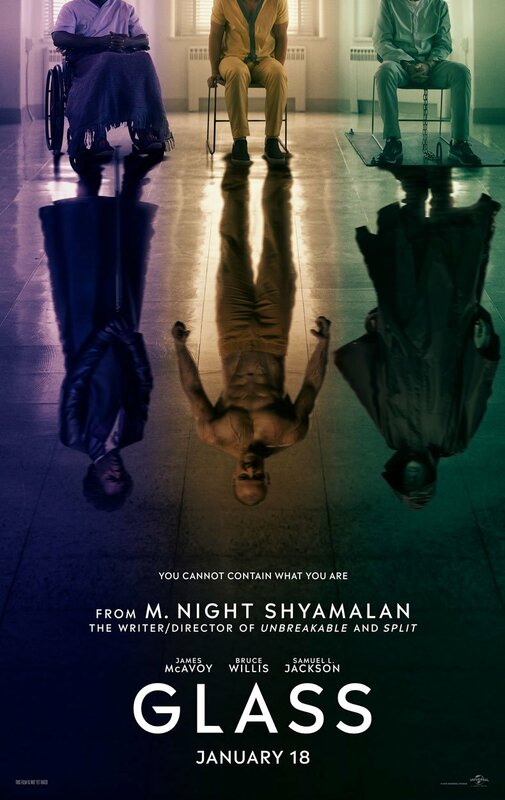 Either way, what Shyamalan did with that last minute twist ending was fantastic and completely unexpected.Given this trailer, it looks as if Glass will not only expand on McAvoy's Kevin, but bring us up to date on what Bruce Willis' David Dunn and Samuel L. Jackson's Elijah Price have been up to in the nearly twenty years since that fateful train crash. The trailer begins by highlighting Sarah Paulson's new character, Dr. Ellie Staple, who states she is working in the ever-growing field of those real-life humans who actually believe that have supernatural abilities. It's certainly worth wondering if Shyamalan will incorporate the rising popularity of super heroes and comic book-based movies into the reasoning for Staple's consistently growing field. Whatever the case may be, it seems that there have certainly been some lines drawn as to those who think these people might actually have been blessed with powers and those who believe it to be based in psychological issues and tricks of the brain. Naturally, Jackson's titular character believes in the former and it seems his ever conspicuous Price AKA Mr. Glass will have a strong hand in driving the narrative dynamic between Kevin and Dunn's hero and villain. Furthermore, it will be interesting to see how Shyamalan balances the two different tones of the two different films that each birthed these characters. Unbreakable being more of an ominous drama whereas Split was sold completely as a horror flick. Needless to say, it's hard not to be excited for what this crossover holds as McAvoy especially seems to have taken the opportunity and run with it, Willis looks like he's actually invested in working again, and you know Jackson loves the idea he gets to be the mastermind behind all of this. Glass also sees the return of Anya Taylor-Joy, as well as starring Spencer Treat Clark, Charlayne Woodard, Rob Yang, Luke Kirby, and opens on January 18, 2019. Synopsis: From Unbreakable, Bruce Willis returns as David Dunn as does Samuel L. Jackson as Elijah Price, known also by his pseudonym Mr. Glass. Joining from Split are James McAvoy, reprising his role as Kevin Wendell Crumb and the multiple identities who reside within, and Anya Taylor-Joy as Casey Cooke, the only captive to survive an encounter with The Beast.